Insulin like growth factor-1 (IGF-1) is a substance which in manufactured by recombinant DNA technology. 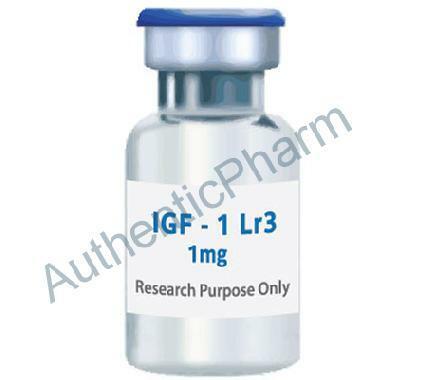 IGF-1 is the primary mediator of the growth promoting effects of human growth hormone. As such, the substance also can stimulate the growth of bone, muscle, and internal organs. Its effects on skeletal muscle are also highly hyperplasic, meaning it causes an increase in cell number. Unlike human growth hormone, however, this substance has very strong insulin like effects. It can support growth by increasing the uptake of amino acids, glucose, and fatty acids, but lowers blood sugar levels so efficiently that it can induce severe hypoglycemia if to high of a dose is taken. Among the other anabolic effects that IGF1 can produce in the body are things such as increasing protein synthesis, increasing nitrogen retention, as well as inducing the growth of more muscle fibers. When an appropriate amount of amino acids (protein) is available, all of these actions within the body are able to be completed. It has been demonstrated that IGF1 can help to improve collagen production as well as the reproduction of cartilage in joints. The hormone has also been shown to exhibit the ability to act as a neuro-protector and promoter mainly because IGF1 receptors are located in the tissue of the brain. It has been demonstrated that there is a potential for when supplemented with IGF1 a decrease in the progress of some brain diseases can be brought about as well as slowing the deterioration of brain function in some elderly subjects. In terms of dosing for IGF-1, users have reported seen good results when administering dosing ranging from 100 to 160 mcg per day. This total dose would be split into several injections, most of which would likely be administered post-workout.